King Sokmon’s advice on money management hinges on prudence, wisdom – and seizing opportunities at the right time, as we see from the famous lines of Ecclesiastes 3: 1-8, which tell us that there’s a time for everything under heaven. For veterans of the US military services, Veterans Administration loans can open up opportunities to go back to school, buy a home – and even start an infesting career. 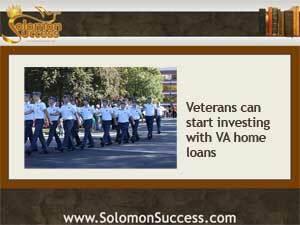 That definition of residential property means that qualified veterans can get a VA loan – with nothing down – to buy a multiples of up to four unites s long as one of the units becomes a primary residence. The property could even include a business, as long as the borrower commits to living on one of the units while renting the others out.